10 வருடங்களுக்கு முன் கடலூரில் ஆரம்பித்த தமிழக BSNL ஓய்வூதியர் நலச்சங்கம் ஆல்போல் தழைத்து அருகு போல் வேரோடி நெடிதுயர்ந்து எந்த வேறுபாடும் இல்லாமல் சேவை செய்துக் கொண்டு வருகிறது. 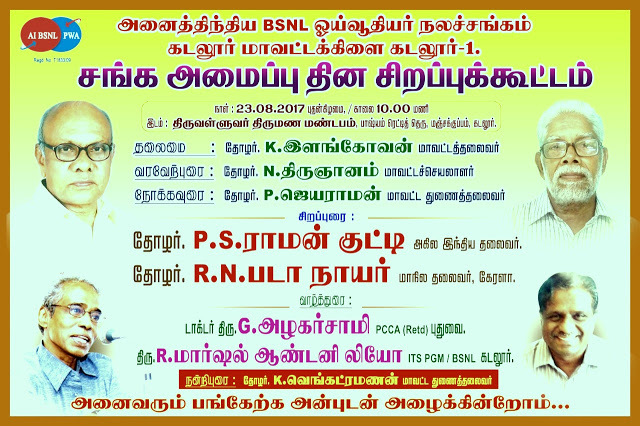 Once again you are coming to our AIBSNLPWA Cuddalore Organization Day meet on 23-08-2017 at our request. 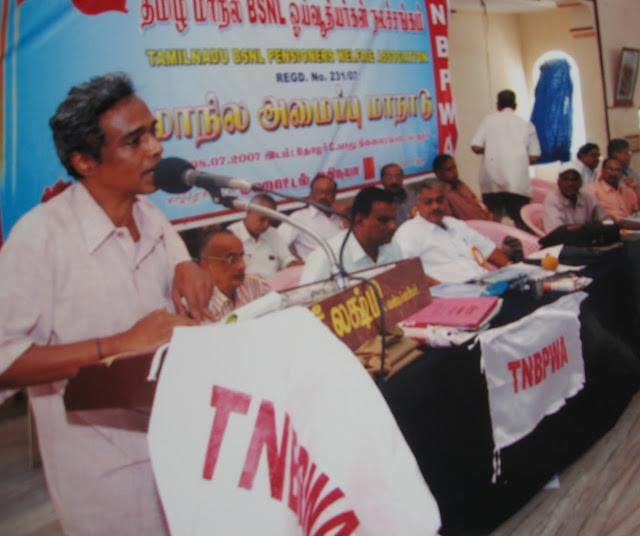 It is usual to remember you by Our leaders and members because of your good will gesture and whole hearted affection during your era in Tamilnadu here.You have given deliberations on 8-7-2007 at inaguration of FIRST TAMILNADU BSNL PENSIONERS WELFARE ASSOCIATION -Cuddalore . We have grown like a Banyan tree with cluster deep roots now because of good will wishes from many great people like you. You have enquired all of us at the times of FLOOD 2015 about our safety and conveyed your wishes.This shows your deep love and parental care towards us. We will be happy to see you and to hear your speech. AIBSNLPWA leaders and members will remember you ever and convey our thanks.